So, at the beginning of December, my wife and I went to see Matthew Larsen and the Documents along with Darlingside at the Montague Book Mill in Montague, MA. We saw many friends at this show, two of whom (that will remain nameless to avoid embarrassment) told us they had just finished watching all four seasons of That’s So Raven! on Netflix on-demand on their Nintendo Wii. I’ll point out that this couple are grown adults and currently have no children, which means they chose to watch this Disney Channel show of their own accord. The female half of this couple reminds us quite a bit of Raven in her personality and way of speaking on occasion, so the That’s So Raven jokes tend to fly freely. One of the members of Darlingside is dark-skinned (of Indian descent, I believe), and he talked about how the other band members needle him when he speaks his native tongue. All in good fun, of course, but after the show we were joking about how it could have come across as racist (teasing the foreigner for speaking a funny language other than English). 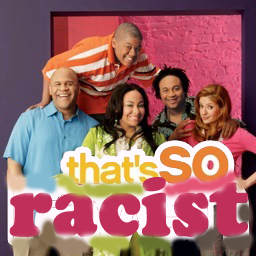 While downstairs in the line for the restroom, the male half of the Raven-obsessed couple and some others were talking about the on-stage discussion, and then started doing a jig, singing “That’s so racist!” to the tune of the That’s So Raven theme song. It caught us off guard, but it was truly brilliant. And it has sparked even more “That’s So _______!” jokes.